The video below gives a brief overview of Cubixx and myCubixx from ASD Healthcare, an AmerisouceBergen Specialty Group. Cubixx is a large RFID refrigerator solution like you’d see in a pharmacy, and myCubixx is its little brother that is used by patients as a personal RFID controlled refrigerator at home. Pretty cool concept. More information can be found in the product brochure here. The innovative technology of myCubixx puts life-saving medications at the patient’s fingertips. For hemophilia patients, myCubixx reporting technology ensures that patients receive and follow the most beneficial treatment plan for their needs. Preventable events – like high-cost emergency visits – are reduced or eliminated all together. Patient compliance improves, leading to better healthcare outcomes for a higher quality of life. Product tracking and accountability also improve with the advanced data-capture capabilities of myCubixx. When accessed, myCubixx records real-time data that provides visibility and transparency to partner stakeholders – payers, healthcare providers, caregivers and more. Using radio frequency monitoring, myCubixx ensures that only patients or caregivers gain access to the life-saving product. Ultimately, the myCubixx data reporting system lowers cost and delivers better healthcare results for healthier lives. Small units allow healthcare facilities to give patients in-home access to life-saving medications. Exclusive treatment reporting capabilities deliver real-time data to stakeholders. Network and radio frequency technologies monitor real-time product use. Web portal access provides stakeholders total visibility of actionable data. Technology helps improve treatment compliance, healthcare reporting and product accounting. myCubixx – taking the guesswork out of treatment compliance,healthcare reporting and product accounting. 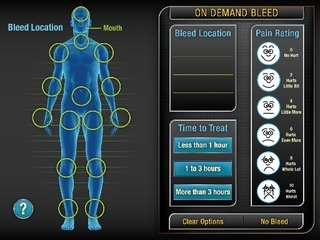 Patient inputs bleed details on myCubixx touch-pad tablet. Target joint, pain rating and treatment are recorded. Details are sent to healthcare providers. myCubixx unlocks to provide product access. myCubixx records how much product is taken.